Posted by Destin Real Estate Sales on Thursday, March 9th, 2017 at 9:29am. Now's your chance to live "happily ever after" at this unique four-bedroom property for sale that encompasses 4,087 square feet of rustic Tuscan splendor! 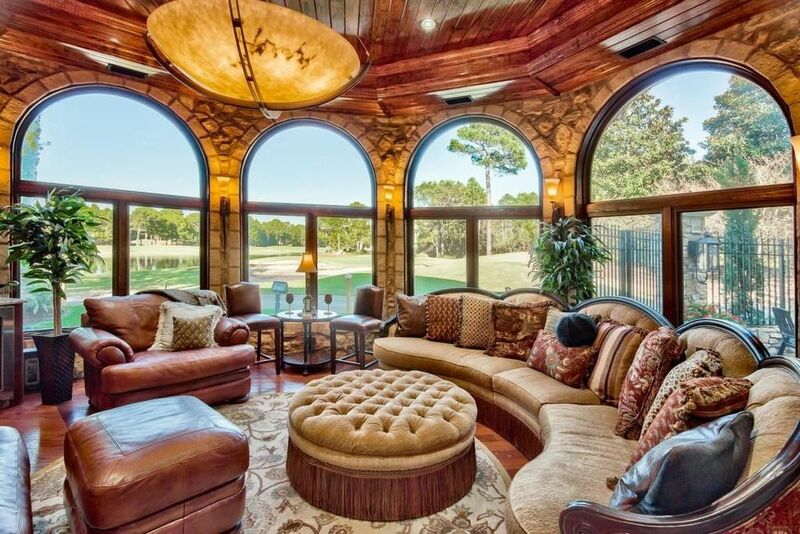 It is prominently perched overlooking the 12th fairway of the Raven Golf Course at Sandestin Golf and Beach Resort in Miramar Beach. The panoramic views here are phenomenal since they include the lush lawn fairway and a forested lagoon that provides enchanting scenery. The privileged world of Sandestin is a 2,400 acre gated world that spans across from the glowing emerald hued gulf to the wide expanses of Choctawhatchee Bay. Sandestin is an exclusively gated perfect, wonderful, beautiful world away from everything else. It includes four multiple award winning championship golf courses, a Tennis Club, a private yacht marina, a New Orleans colonial styled village called Baytowne Wharf and the upscale Grand Boulevard Town Center. Specialty shops, fine restaurants, lively bars, amusements, seasonal festivals and firework displays abound here. 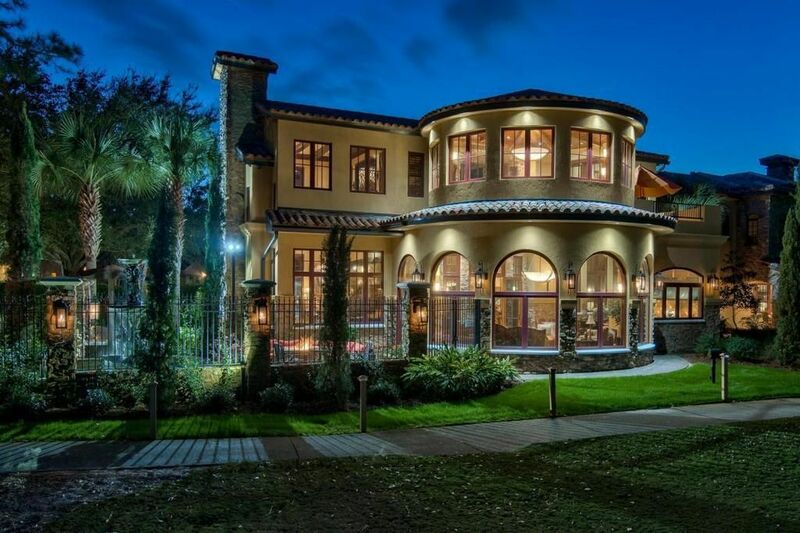 This Fairytale Italian Villa is located at 1839 Tuscana Place does indeed look like a castle with walls of stone and stucco, double turrets, decorative custom ironwork, open flame gas lanterns and a thick Mediterranean tiled roof. Lush landscaping and stone pillar columns that frame the gardens with wrought iron fencing surround it. The interiors are quite breathtaking with richly beamed soaring ceilings and circular window wrapped rooms overlooking the gardens. A private courtyard includes a stone tiled patio that is reminiscent of the charming French Quarter and features a bubbling fountain decorated with towering classic statuary. It is lighted by some of the sixteen open flame gaslights that provide a rich old world charm. 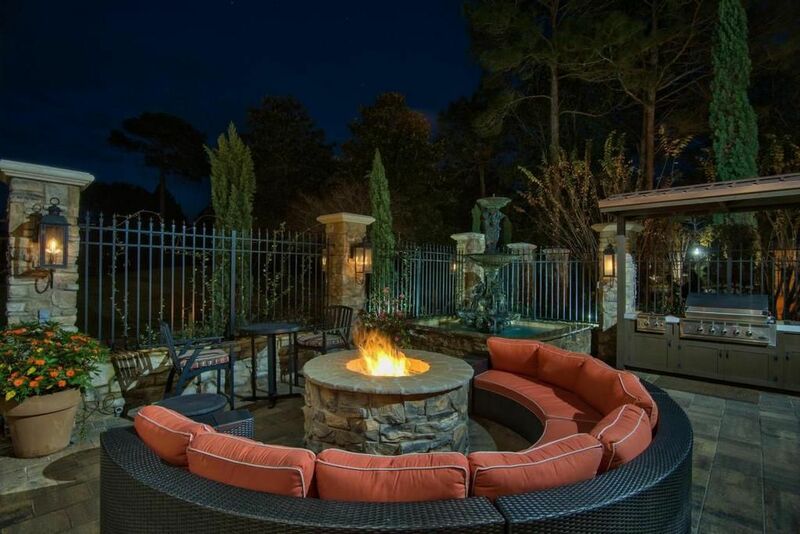 A half round outdoor cushioned couch is nestled beside a center gas fire pit and nearby a large stainless steel gas grill is available for cookouts. Another fire pit sits beside the tropically landscaped gardens. 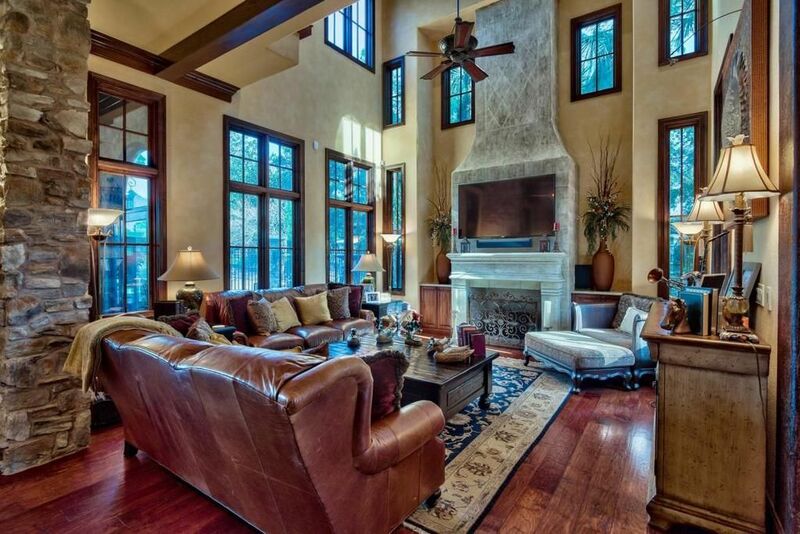 Fabulous finishes inside include a rich assortment of granite, marble and rich tile work. 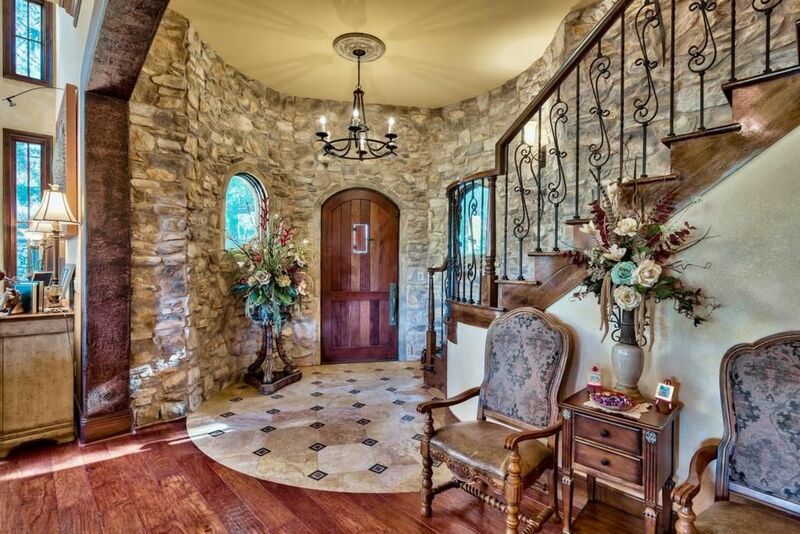 The rounded entry foyer has travertine marble flooring with ebony tile flourishes and a wrought iron chandelier. This faces the Great Room and a grand staircase that has a hidden Wine Cellar tucked away underneath. The Great Room has soaring richly beamed ceilings, multiple individual windows above and below as well as a carved white marble fireplace. Extra wide plank hardwood flooring flows into the open formal dining area beside the marble tiled Gourmet Kitchen. 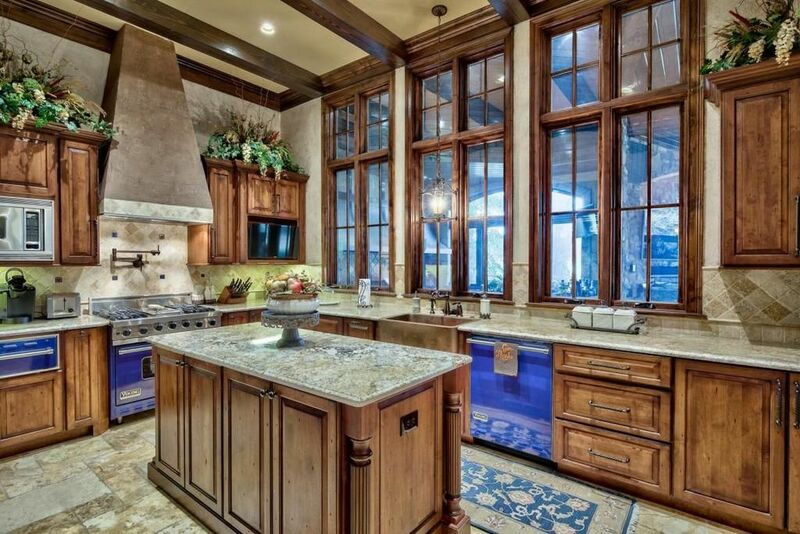 This amazing kitchen features custom blue tinted top of the line stainless steel appliances that include a large gas range and a huge separate vented covered range for grilling. There is rich custom cabinetry, a two sided bar, a kitchen island, a separate built-in Wet Bar and walls of sunny windows. The kitchen opens out into a handsome den with a fireplace and has circular stonewalls that encase five towering arched windows overlooking the golf course as well as a set of doors leading out to the courtyard. The opulent Master Bedroom with beamed ceilings and a stone fireplace includes a luxurious classically styled bath. A Music Room with a cathedral ceiling and a circular multi-windowed turreted den with another stone fireplace flank this all-inclusive suite. A balcony overlooks the sensational scenery outdoors. The other three bedrooms are equally opulent and have access to full luxury baths. Contact our Ocean Reef Real Estate office today at (877) 392-6085 for more information and schedule a VIP tour today!